We got these great Pediped shoes for Eli the other day. How cute are they? These are called the Maxx Hubby likes to describe them as baby moccasins. They are incredibly soft and flexible. Eli loves them. He has been walking all around holding our hands. I was worried that they would scrape up right away, especially on the soft bottoms, and look not so desirable. But after about a week of wearing them that doesn’t seem to be a problem. Granted he is doing a minimal amount of walking, but even a stroll across a Walmart parking lot holding one hand of Momma D and one hand of Daddy D didn’t seem to scrape them at all. 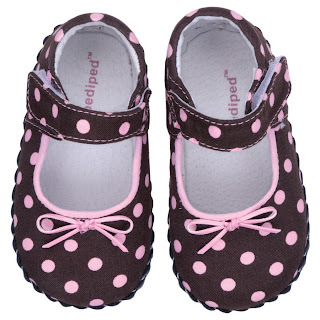 Pediped shoes come in a cute variety of styles. I love the brown and pink polka dotted Grace for girls. I also like the traditional sporty blue and white styling of the Demetri for boys. Pediped shoes can be purchased at www.pediped.com. Those look awesome. Wish they had been around when Evan was a baby.